As I’ve mentioned several times, I have a group of carefully chosen advisors who have provided me with invaluable input for my blog. They have taught me, corrected me, and encouraged me. My intention from the beginning was to use them to also write some articles themselves for the blog. The article below was contributed by Michael Burns, and is actually a small excerpt from his upcoming book that is simply ground-breaking brilliant. I chose to publish this article during the Christmas season for reasons that will become obvious to you as you read it. But first, a brief introduction to Michael, followed by his thought-provoking article! Michael Burns was born and raised in Janesville, Wisconsin in the United States. He taught high school history and coached boys’ varsity basketball at an urban high school in Milwaukee for nearly a decade. Michael married his wife, MyCresha, in 1997 and they have two sons that are 21 and 13 years old. Michael is currently on staff as the teacher for the Minneapolis-St. Paul Church of Christ, is the director of the Minneapolis Ministry Development and Training Academy, and a frequent teacher in the African Ministry Training Academies around Africa. Do me a favor. Read the next two sentences and do what they say after you have read them. Close your eyes and keep them closed. While they are closed, get a mental picture of Jesus in your mind. Okay, you can open your eyes. Perhaps I should have encouraged you to read the next three sentences instead of just two. Hopefully you opened your eyes and are back to reading this. What did you picture? What did Jesus look like? Does it matter what Jesus looked like? Yes and No. Scripture never gives a detailed physical description of Jesus. Those who knew him seem largely uninterested in such things. The closest the writers of the Gospels ever come is when they described the Transfiguration, and even then, the focus is on his heavenly transformation rather than what he looked like bodily. There is a physical description of sorts in Revelation (1:14-16), but Revelation is a deeply symbolic book, so any portrayal there probably needs to be examined for its symbolic meaning more so than an historical one. Isaiah prophesies about the Messiah to come, saying that “He had no beauty or majesty to attract us to him, nothing in his appearance that we should desire him (Isaiah 53:2). Some have pointed to this passage to assert that Jesus was homely. But the point here is probably more that he wasn’t special or majestic in any way. Nonetheless, it doesn’t get into any specific physical descriptions either. In the end, Isaiah’s point is likely that he just looked like a normal person. Plus, standards of physical beauty change dramatically over time, so that wouldn’t mean all that much to us today if Isaiah was trying to communicate that he was ugly. If Scripture seems unconcerned with Jesus’ physical appearance, should we care? No, in the sense that Jesus is transcendent. He came for all people. Anyone who is willing to enter the life of Christ is welcomed into his body and his family (Galatians 3:26-29). Jesus obviously was a Hebrew but exactly what he looked like and what color his skin was shouldn’t matter. Did You See a White Jesus? But, things are not that simple, are they? Because of what human beings have done in the two thousand years between his life and where we stand today, what Jesus looked like does have to matter. Here’s why. When I asked above what Jesus looked like, what did you picture? Let me be more direct and to the point. Was he white, with blond or light brown hair, tall and thin? Chances are good that he was. The church I grew up attending had several pictures of Jesus hanging throughout the building. In one picture, a warm and jovial Jesus sat as children piled onto his lap, mesmerized by his words. In another, Jesus braves the rugged landscape of the wilderness carrying a lost sheep that he had found. Perhaps the piece-de-resistance was a reprint of the famous painting, the Head of Christ, created by artist Warner Sallman in 1941. Since its creation, this painting has become the iconic image of Jesus in our times. The one thing that they all had in common was that Jesus was decidedly white. He had long hair, thin features, very fair skin, and based on those pictures and every movie I had ever seen about Jesus, he was also stunningly handsome. This was par for the course. In addition to pictures and movies, every Christmas card, every picture of Jesus in Bibles, virtually everywhere I looked, I saw a white Jesus. This was pervasive in the Western world in which I was a part of growing up. So much so that one day, while in my early twenties, I walked into someone’s house who had a picture of Jesus depicted as a more of what appeared to be a black man, and I was deeply offended and irritated that they would change the race of Jesus just to make him seem more like them. Of course, I knew even then that Jesus was Hebraic, but somehow that never clicked with me that first century Jewish people were hardly what we would call white. It never occurred to me that my image of Jesus was created to make him look more like me. I don’t believe that, in the case of my experiences, those around me were intentionally foisting a white-washing of the gospel to intentionally prop up a white supremacist version of the Christian story, but it was very “Caucasianized” just the same, mostly by inaction than by anything else. Every Bible story book I read depicted almost exclusively white characters. Noah was a kind elderly, white gentleman with a long beard. David was a handsome white lad. Jesus and the apostles were always white. That was my perception growing up. To this day, when I visualize a scene from Jesus’ life in my mind, something very much like Sallman’s Jesus pops into my head for a second, and I have to be very intentional about seeing something else; something more accurate. Forensic anthropologists, archaeologists, and historians all agree that as a Middle Eastern Jew of the first century, Jesus almost assuredly had medium to dark brown skin. And given all the walking around and work that he did outside, he was probably quite sun-tanned as well. The earliest depictions of Jesus in art show this historical truth as they display a more classically styled Asiatic man with dark brown complexion. That was consistent until the sixth century when Byzantine artists began to depict Jesus as a man with white skin, a long beard, and hair parted down the middle. It wasn’t long before this light-skinned Jesus replaced the more historically accurate version, and became the standard fare for depictions of the Messiah. People tend to naturally depict others as looking more like themselves, and this was no exception. But it was inaccurate and they surely would have known that this was not what a first-century Jewish man would have looked like. While it was erroneous at this point, it wasn’t harmful, at least not yet. But if we fast forward a thousand years or more, we find Western Europe in the throes of colonialism and expansion. A close second to the economic motivations for colonialism was the missionary zeal that often followed, to call the darker-skinned “heathens” around the world into submission to Christ. Everywhere they took this version of Christianity mixed with colonial dominance, they sold a version of the white Jesus. Christianity was often misused to prop up and justify the horrors of slavery and the abuses of colonial conquest, and the purveyors of this syncretized version of Christianity and power seemed to go out of their way to make sure that everyone understood that Jesus was white. As the Puritan influence in the country waned, the image of white Jesus took hold powerfully. It helped slave owners justify their cruel treatment of others as they carefully explained that Jesus was a white man and that other races were the result of a curse. In fact, the doctrine of the curse of Ham was the standard biblical teaching in the West for hundreds of years. In short, this teaching asserts that Ham was the son of Noah who violated his trust and sinned against Noah. Noah then struck back at Ham by cursing him and his descendants forever with dark skin, the sign of the curse, and the status of being slaves to the descendants of Ham’s other brothers. This was not some goofy aberration that could be found only in the deep South. It was accepted as biblical fact in most of Christianity for hundreds of years. Blacks were slaves because they were the descendants of Ham. They should, they were told, accept that and be grateful that whites were sharing the gospel with them at all and giving them the chance to be forgiven and accepted as Christians. White Jesus helped to make this lie possible and assisted many people to accept it without reservation. The reality of the Genesis 9 account of Noah and Ham is quite different, though. Noah did not curse Ham, he cursed his son Canaan. The text never makes it clear why, but one possibility is that it was a euphemism for sexual sin (compare the original Hebraic phrasing of Genesis 9:23 to Leviticus 18:7 and 20:11). The curse against Canaan, then, would not be a case of him being punished for Ham’s sin. Rather it seems to be a prophetic curse against Ham’s descendants who would be like him in his sexual sin. Whatever was going on here, it seems certain that it was referring to the Canaanites and has nothing to do with black Africa. There is no indication that the curse is dark skin, and in fact, this narrative has nothing to do with race in any way. Simply put, the curse of Ham ideology is absurd textually, but it did its damage for hundreds of years. The white Jesus myth was often intentionally used to justify treatment of non-white people and convince them they were a lesser grade of human being. The mythology of white superiority was built up and strengthened immeasurably by the intentionally false depictions of Jesus. In other words, the real Jesus was everything that this white Jesus being peddled across the globe was not. Jesus did not have power, he did not subjugate others. He was part of an oppressed ethnic minority. He knew what it meant to be cast off into the margins by the powerful elites. Just imagine how differently history might have gone if the lie of the white Jesus wasn’t accepted or spread. 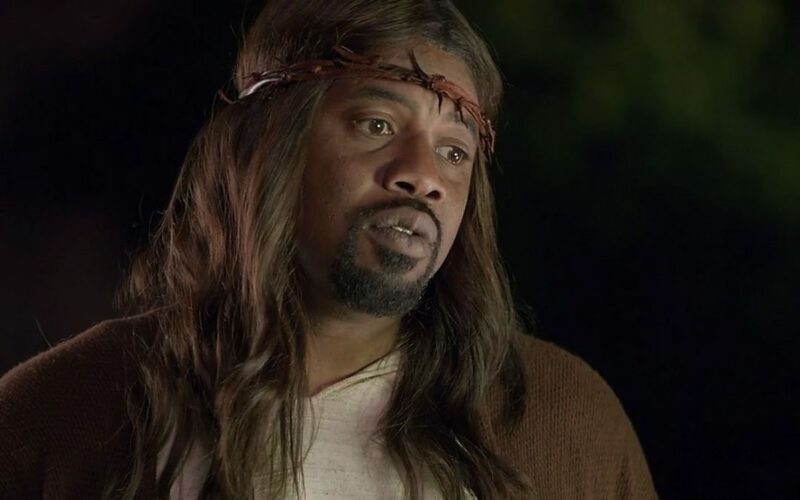 How much more difficult, if not impossible, would slavery and colonialism have been to justify if Jesus was honestly depicted to darker skinned people as he really was, a dark-skinned man. We can never know for certain the specifics of what Jesus looked like, but based on the genetics, culture, and realities of life in first-century Palestine, we can be fairly certain that Jesus was a bit on the shorter side, stocky and perhaps a bit muscular, with dark brown skin and hair. From this perspective, then, what Jesus looks like does matter. Because so much abuse and oppression happened using white Jesus as a weapon and tool, it matters. It is odd that last year a new Star Wars movie came out with a black man in one of the starring roles. There was a great deal of outcry, debate and controversy surrounding that. Imagine the storm that would hit if a new Hollywood blockbuster came out with a movie about George Washington starring Don Cheadle as Washington. Yet, most Christians don’t even stop to think twice about white Jesus. Because of sin and abuse, it does matter that we strive for and demand authentic depictions of Jesus. Jesus’ color doesn’t matter to our salvation but it does matter to the mission. Think of a biblical topic like the name of God. Does it matter what name we choose to use when addressing God, whether it be Father, God, Jehovah, or Yahweh? No, not normally. But what if we are studying the Bible with someone who has spent the last six months studying with Jehovah’s Witnesses? That topic has almost certainly been misused to beat them down and hurt them spiritually. They will have been told that their worship or prayers are invalid and offensive to God unless they address him by his proper name, which they will be told is “Jehovah.” Jehovah was never the covenant name of God. That name is derived through faulty translating work. The true covenant name for God as recorded in the Hebrew Bible is YHWH. But does it matter? It does because the concept has been misconstrued to hurt someone. We need to correct a wrong and so it does matter, I believe, that we not cement this false teaching and use the term “Jehovah” in this case where doing so could hurt or confuse someone. Is a Perception Change Important? We are called to be a cross cultural family of all nations. That is what God wants us to be. There should be no such divisions in the world as race but there are for now. We cannot fully change that in the present age. But we can recognize that a false version of Jesus was created and used to subjugate people for hundreds of years. It was misused to prop up a mythology that one race was superior to the others. The image of Jesus became a weapon. If you were honestly unaware of all that (and you may well have been), you are no longer. Are we willing to see the image of white Jesus as something that has been used as a negative tool and has hurt many people in the past? Are we willing to return to the transcendent Jesus by returning to a more faithful image? That might sound counter-intuitive but because the image of white Jesus has been so seared into our collective conscious, it is naïve and ineffective to simply say that it doesn’t matter or that we just won’t use an image of white Jesus anymore. To counteract the damage done to God’s message of salvation for all people, we must, I believe, deconstruct the white Jesus image. I believe we need to actively teach about this abuse and show people what the real Jesus would probably have looked like. We should never, of course, worship images of Jesus, and in that respect, what he looked like is irrelevant. But it is important that we teach truth and correct the mistakes of the past, which I believe make it important for us to affirm and embrace a dark-skinned Jesus. [i] Blum, Edward J. and Harvey, Paul, The Color of Christ, The University of North Carolina Press, Chapel Hill 2012. Pp. 20-21.